Former Virginia Gov. 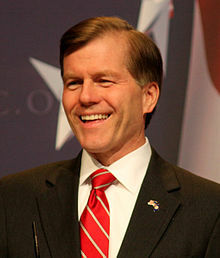 Robert F. McDonnell, who had been mentioned as a vice presidential candidate at one time, was convicted Thursday in U.S. District Court in Richmond, Va., along with his wife Maureen, of public corruption and selling the office to a free spending Richmond businessman for golf outings, lavish vacations and $120,000 in sweetheart loans, the Washington Post reported. Matt Zapotosky and Rosalind S. Helderman of the Post reported that a federal jury deliberated three days before serving up the verdict. Robert McDonnell was convicted of 11 counts and his wife, nine. The jury also acquitted the couple of several charges. The verdict means that Robert McDonnell, who was already the first governor in Virginia history to be charged with a crime, now he holds an even more unwanted distinction: the first ever to be convicted of one. He and his wife face decades in federal prison, though their actual sentence will probably fall well short of that. Posted: 9/4/14 at 3:31 PM under News Story.